It's to represent the year that newgens were produced in game, and the letters just separate the different players from each intake. 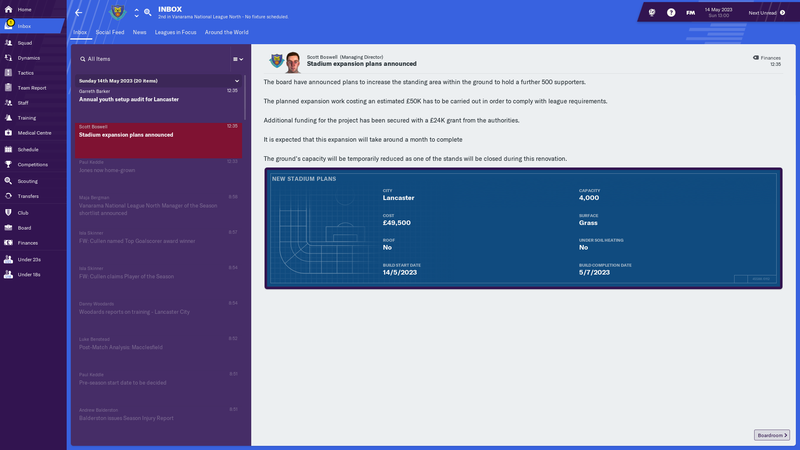 So two players that were produced in 2029 would be called 29A and 29B. 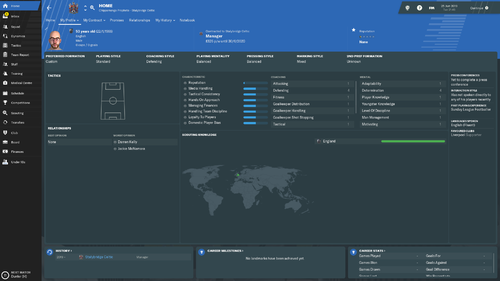 My previous director of football negotiated contracts for several key players before I took over at the club. I stupidly assumed it was all taken care of. Turns out he lowballed all of them and now 3-4 key players are leaving for free and refuse to negotiate. 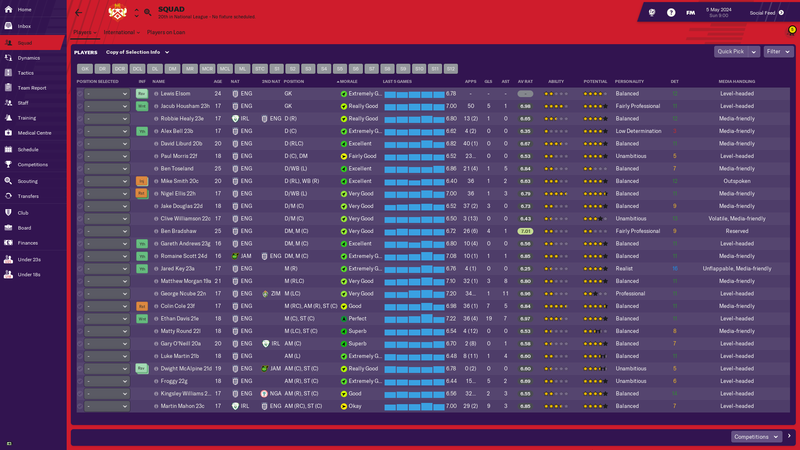 So I have a thin squad and have to scramble to find some free transfers to fill out the first team. 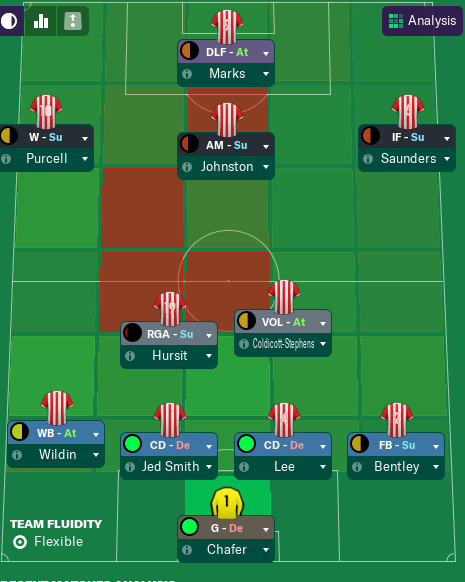 Managed to put together a decent squad to start the season. I am aiming for a mid table finish but hope we can sneak into the playoffs. Reputations have been updated in the opening post, no major changes. 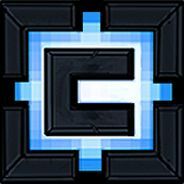 Will be documenting my Journey through this link if you guys want to keep up! Hit the like button for me! Decided gentle change wasn't the way anymore, changed formation and dropped almost the entire starting line-up, and... it totally worked! Heck, we're on fire! 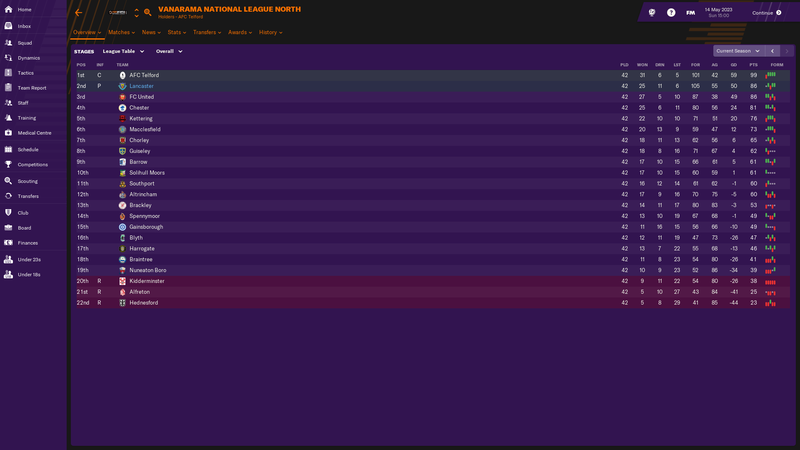 Telford were never within reach, but I'm thrilled to nab 2nd ahead of FC United, even if by the slimmest of margins! Right. More playoffs. 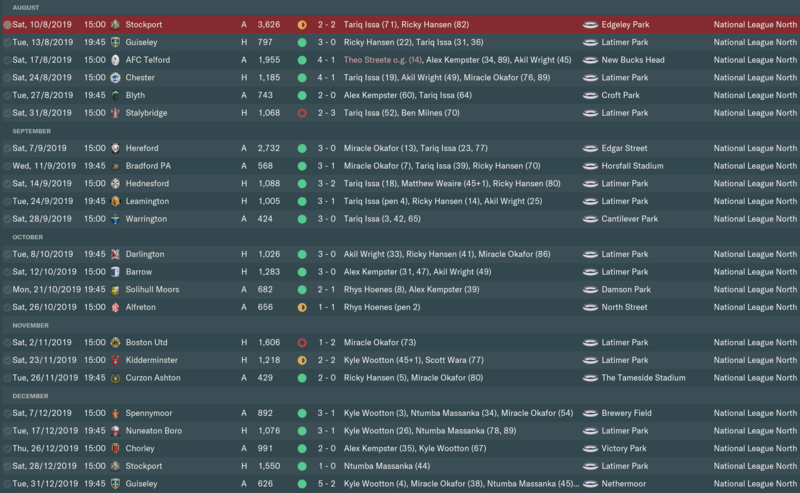 This time at home to Chorley — our only rival at this level — and it was about to be another sad affair after my central defender got himself sent off early and Chorley still had the lead with just minutes to go. Thankfully, a moment of injury time brilliance gave us a lifeline. As Chorley threw themselves forward chasing a (deserved) extra time winner, we pounced on a midfield deflection and, well, Rollinson didn't need to think twice about that one! The final ended up being more of a test of nerves than mettle as we kept taking the lead and Macclesfield kept clawing themselves back within striking distance, but in the end we held and are — FINALLY! — promoted! 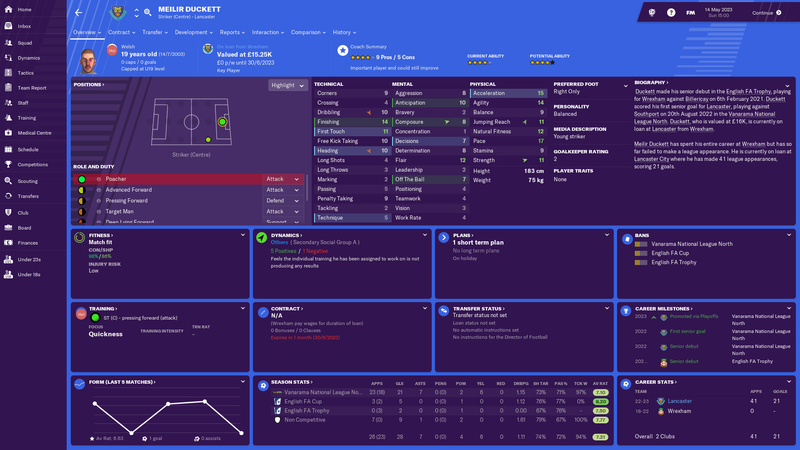 Many new faces, most notably Baxendale who's got the best average rating in the league and Duckett who've been a great threat to put to any team playing a high d-line. The biggest plaudits must however go to Mallass who, yet again, tops our scoring charts with an incredible 36 goals despite giving up a number of starts to Duckett. As reliable as I could ever wish for. Looking a bit better thanks to the cup runs, though the board is taking it as an opportunity to stop the cash injections rather than to get back in the black. Oh well. I'm not sure what became of the new stadium plans — the chairman's been quiet about it for three years now — but we're definitely getting an expansion. If this brings our gate receipts up a bit, I'm certainly all for it! Aim for next season: Stay up. Stay up at any cost. 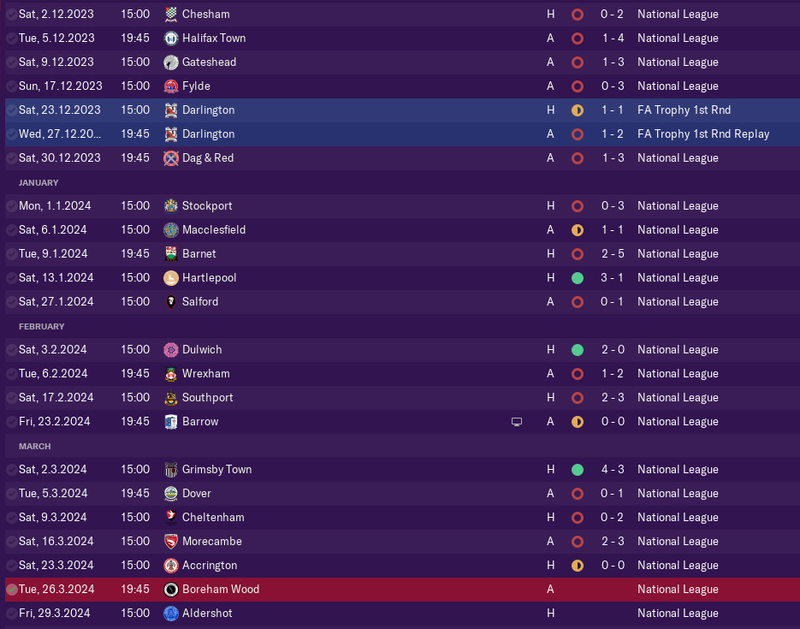 This year we brought out the 4-4-2 and we ended up in Vanarama North, we again started strong, it even seemed we would beat our victory and point record but with only 2 points from our last 9 games we ended up in 16th. It was not a bad season, new tactic with more goals, but we have a weak link in the right side of the defense. Luckily a youth appeared in the intake that hopefully manages to stabilize that side. We have a young goalscorer that each year gets better, some of our youngsters are improving, they give us hope that next season hopefully we break the win and point records. 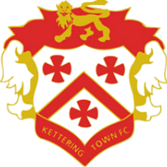 Kettering seem to be the easy team, so with my restart on the full release, I am now the manager of Tamworth. 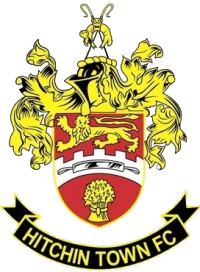 League - Vanarama National League North (sixth tier). 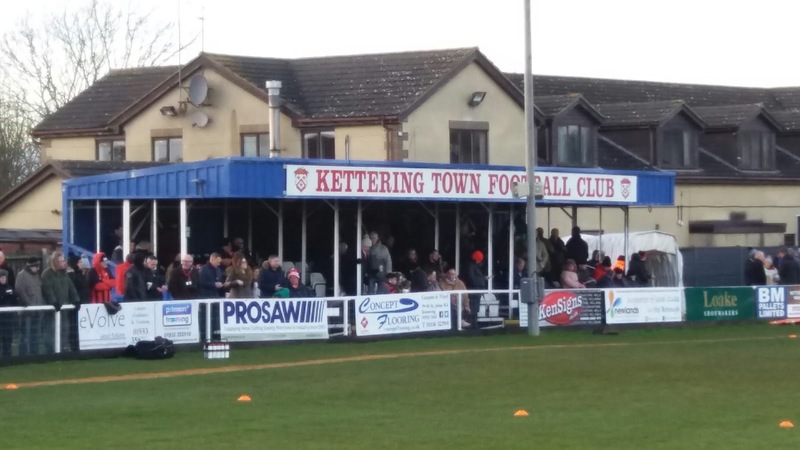 Stadium - Latimer Park, Kettering. Capacity - 2,553 (414 seated). 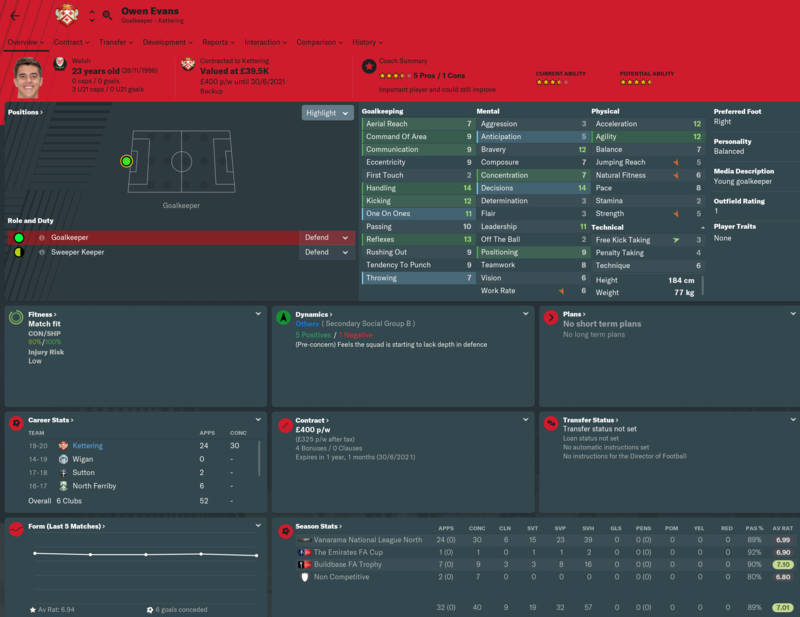 Youth Facilities - Below average. 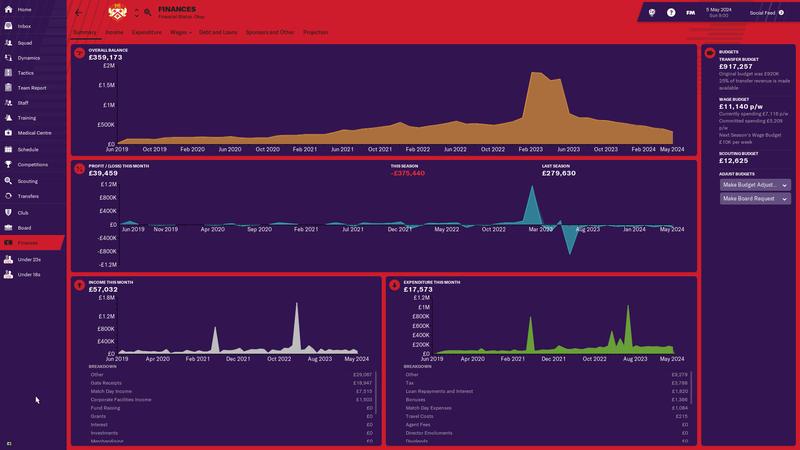 Data Analysis Facilities - None. My expectation - 6th. A play off spot would be great. Wage Budget - £6,570 per week. 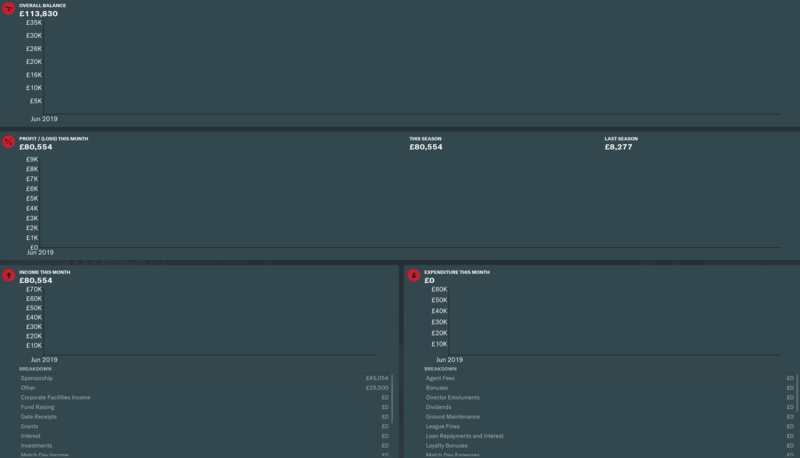 Current Wage Bill - £4,752 per week. Some decent players here, but I could do with some real quality. 2018/19           N/a                N/a               Vanarama National League North                             N/a              N/a         Appointed on 25 June 2018. 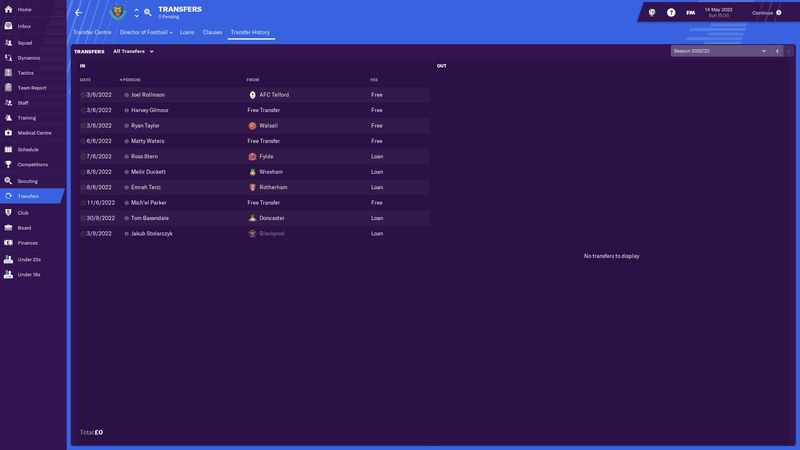 I am back for another go, Kingstonian managed to win the premier league just before the FM19 beta dropped, this time we won't start so late :-) I see the usual suspects are still playing this epic challenge! I am in this season too @Rashidi, having been glued to your Kingstonian save. Off topic - Nice teaser video today! And yes over at Stalybridge Celtic, news has broken. This will be on YouTube I hope? Just got the rules for Brexit. Not too bad. 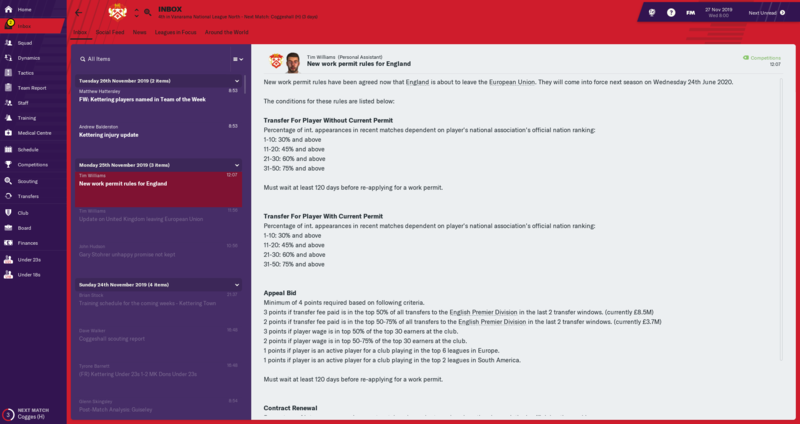 17 foreign player limit, work permit rules. I see some of you have updated logos for your teams. Does anyone have a recommended download? 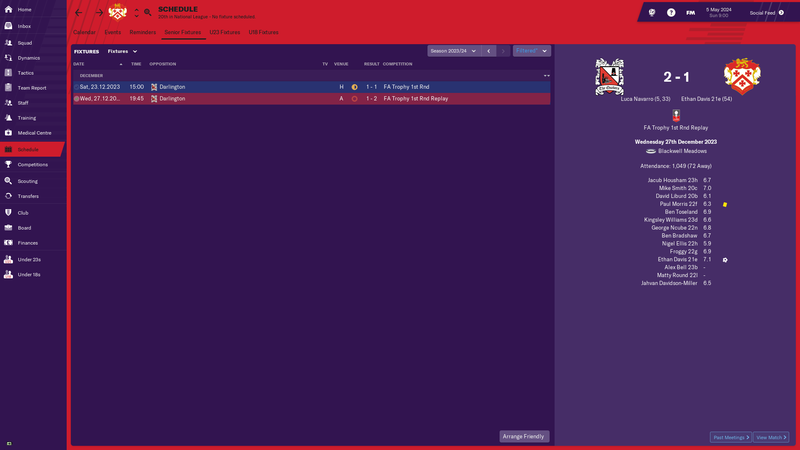 Halfway through my first season with Kingstonian and doing pretty well, but started to get itchy feet and fancy possibly starting again with Farsley. Quite the quandry. If you're still trying Leatherhead would be amazing please! Have you got the save file?? If this how the team is going to play, then I can look forward to a very enjoyable season! Not a bad opening day result, that too away against a side predicted to finish 2nd. 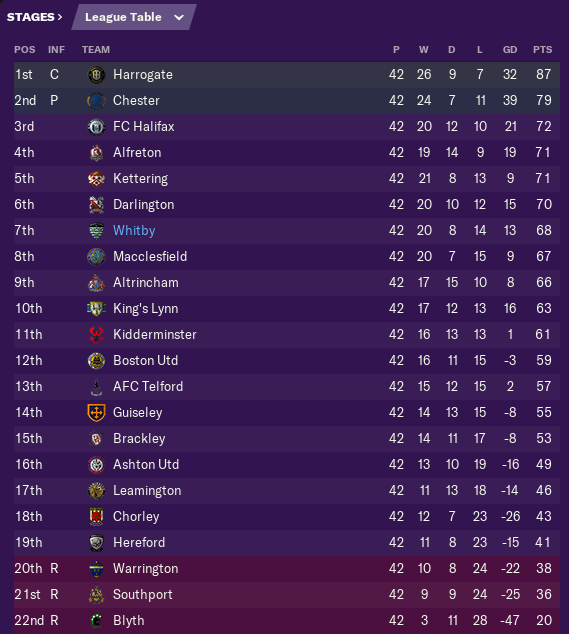 Half-way through the league season and it's looking pretty good! Far away from relegation and a very tight league sees only 8 points separating us in 13th place from a playoff semi-final place in 3rd! 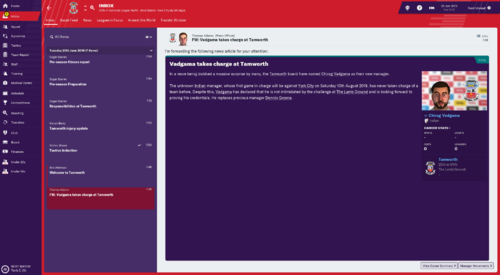 A little bit late to the party, so I am, but please welcome the new manager of Scarborough Athletic! 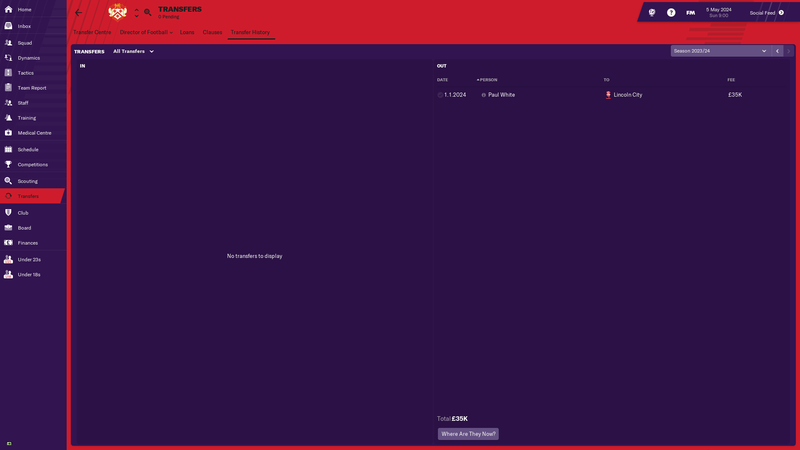 Starting the challenge from the start of FM19 with Dorking Wanderers. Last year I started late and kind of stopped posting updates....but not this year! Also, what the holy **** Dean Brennan? Was it my choice of attire that offended you? An excellent first half of the season and we lie top of the table. We are unbeaten on the road, as both of our league defeats have been at home. I hope a huge win over Stockport before the new year will prove decisive. 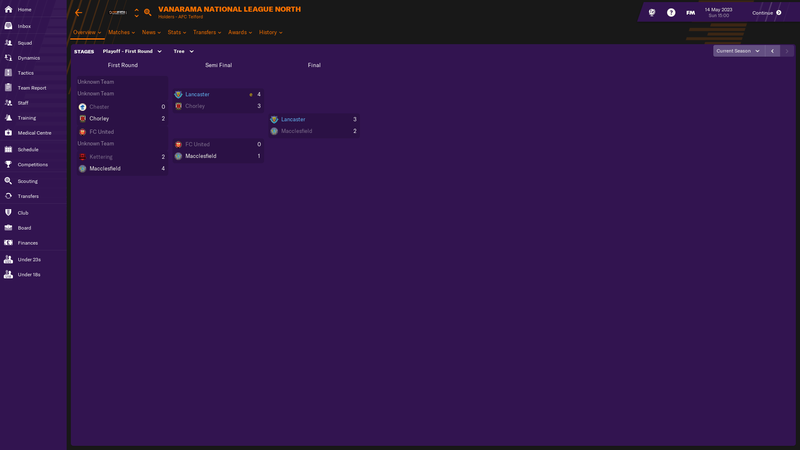 A decent run, ended in the first round proper by League Two side Leyton Orient. Squad Dynamics - As good as I could expect, due to the large number of new arrivals. Transfers In - Quite a few new arrivals, all of which have had significant game time. 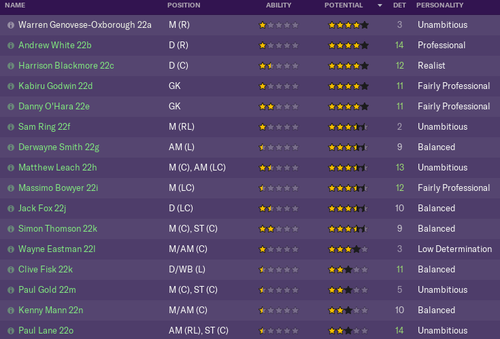 Transfers Out - I am finding it very difficult to move players on, so not a lot have left. Finances - Very healthy. With the wage budget under control, coupled with the decent cup run, the coffers are in good shape. Really finding the step up to the VNL tough as the team has struggled and i can't even find any players better that will join me. 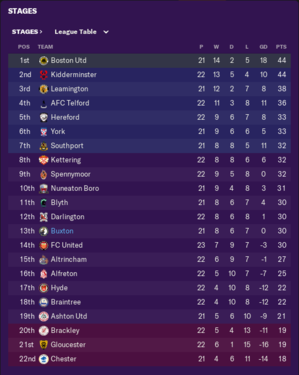 I thought my terrible home form was to blame until i realized i have 17 points from 14 games at home and just 3 (all draws) from 11 away. 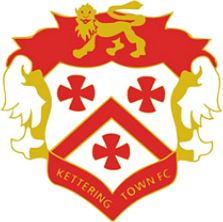 "Scarce few pundits will have been brave enough to pluck Kettering from mid-table obscurity in pre-season and mark them out for bigger and better things but The Poppies did exactly that, surprising everyone as they marched to a quite remarkable promotion." League Table - We probably had our best season so far. 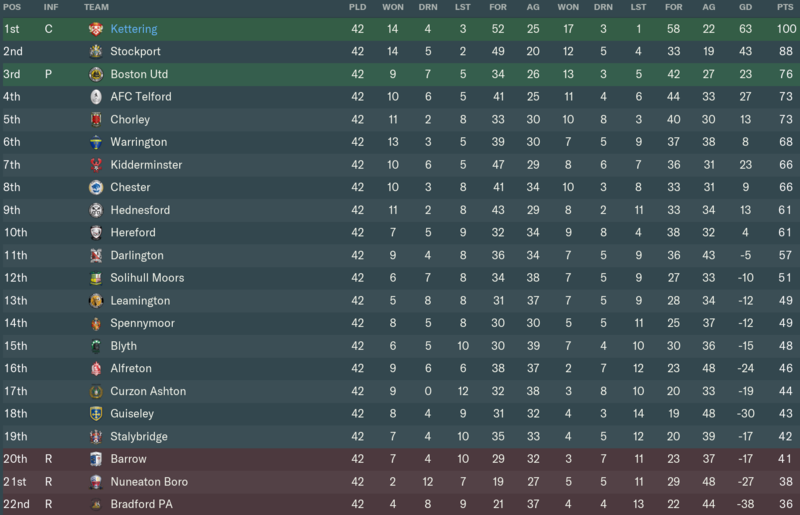 Our record was impressive 32-7-7, However that was only good enough for 2nd place because Ipswich had one of the most ridiculous season I've ever seen. We started poorly and we conceded 11 goals in our first three games and only got one point but just like last season, things just started working. No tactical changes or anything. We were still playing 4-1-4-1 which seems to suit us very well. Cups - FA Cup 5th round was the highlight here. We managed to beat Premier League Watford away in 3rd round. Championship Luton were beaten easily after that but Leeds were too strong. 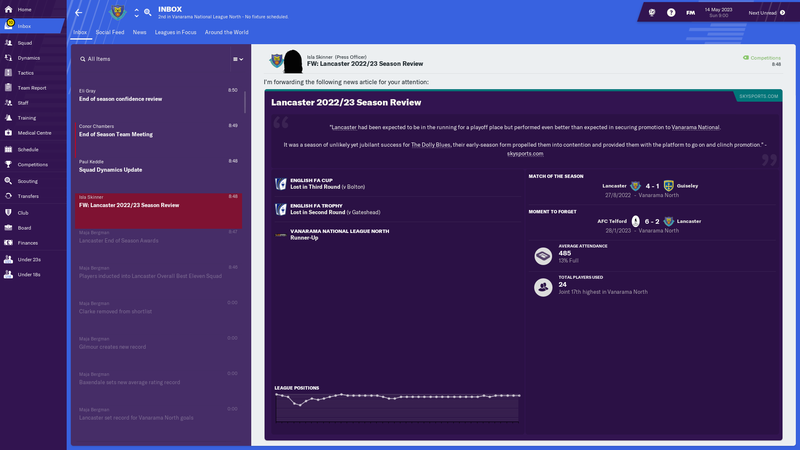 Leeds were struggling a little bit in the Championship so I thought we might be able to proceed even further but it was rather disappointing performance. 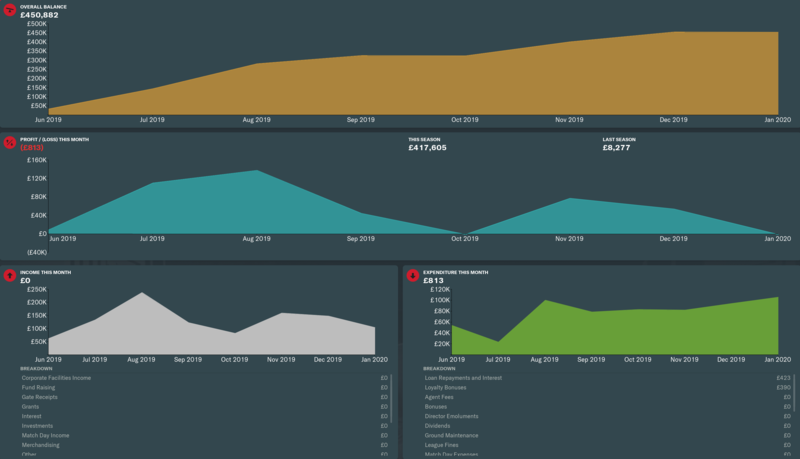 Transfers - We had our first million pound sale. 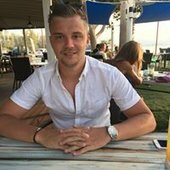 It was defensive minded midfielder Anthonyt Daniels that joined us 18 months earlier in £1,4k transfer. We also spent little bit money on very promising RB from Southampton that had already played few games in Premier League. 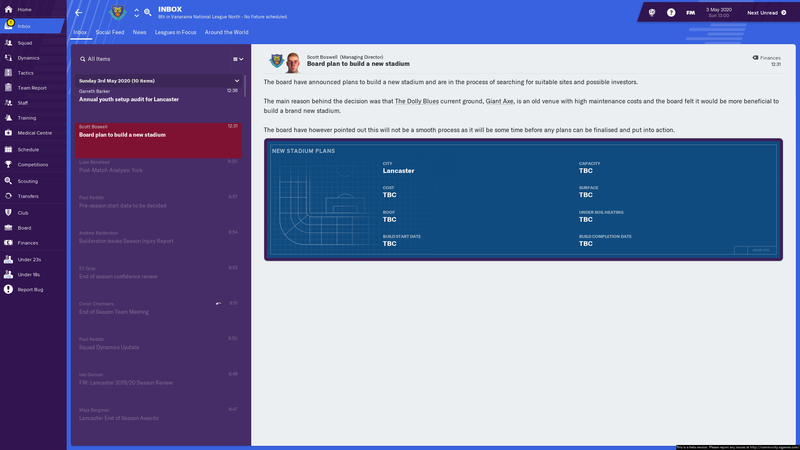 Finances - Very tiny loss here but we invested £1,800,000 in training facilities, increased junior coaching budget and improved our youth recruitment. Aaron Byrne scored 25 goals in League One and was big part of our success. 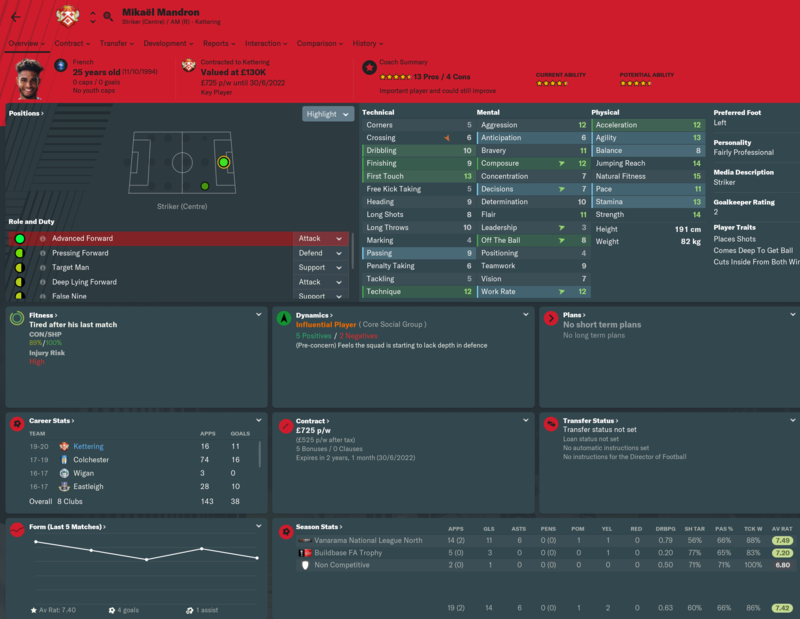 I'll keep him around and see whether he's capable of playing in the Championship. 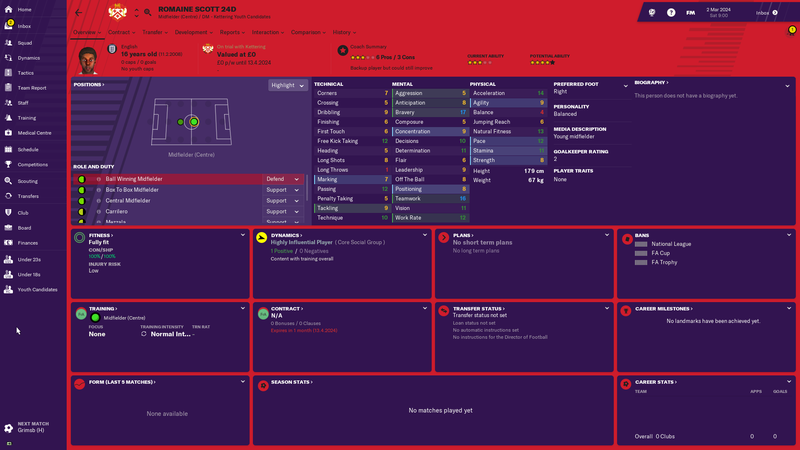 Pierre-Emmanuel Ekwah Elimby joined us in free transfer was immediately our most impressive defender. He is a physical beast. The one and only Wade Hobbs. He had his best season so far. He learnt tries killer balls often player trait and took full advantage of it. Unfortunately Blackburn are finally looking to give him a chance so it's unlikely that we are able to extend his loan. 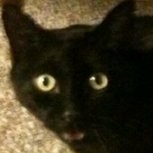 He's been integral for us several years and we'll miss him. We received message that our new stadium project is delayed. This is actually good news because our new stadium will be way too small as expected. Importantly I think we should be able to avoid relegation. I'm fairly happy with our defence. 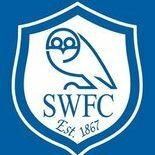 We need to find replacement for Wade Hobbs and strengthen our midfield and attack. 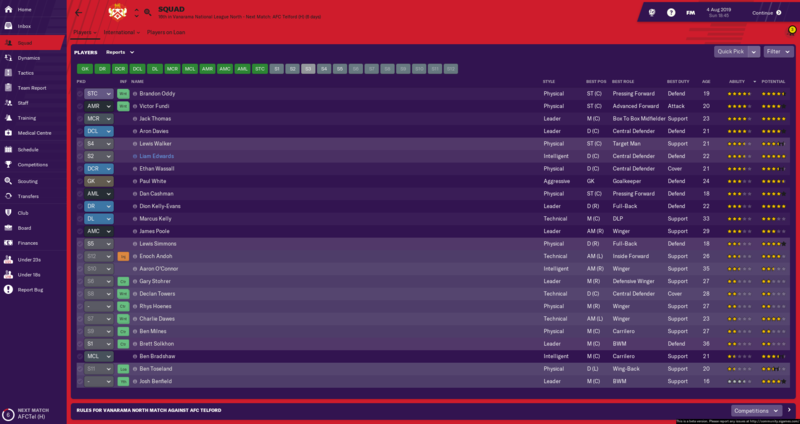 We have little bit of transfer budget but our wage budget is so low that I don't really see us spending too much money. We'll try to exploit the loan market once again. 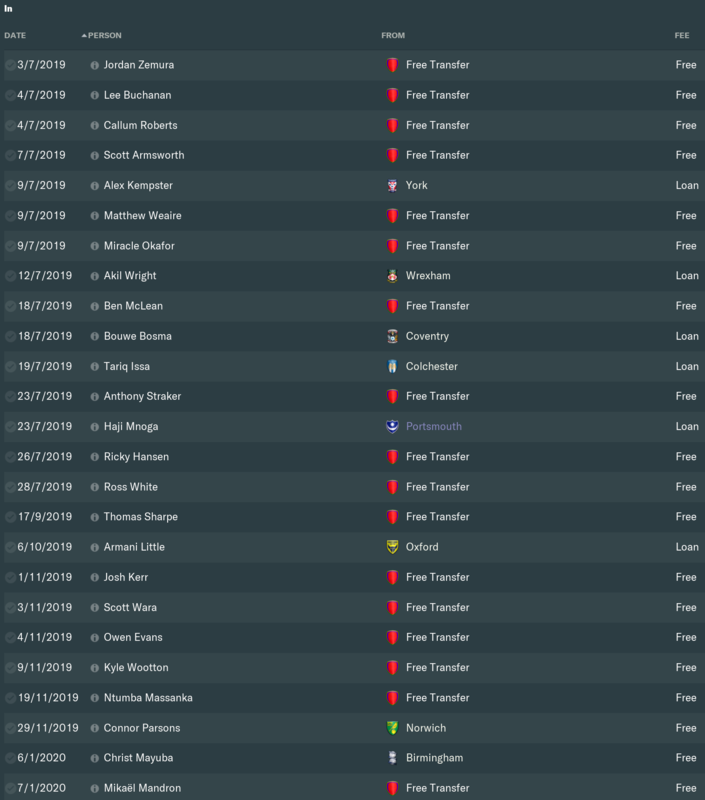 Only got through pre season so far (too much work). 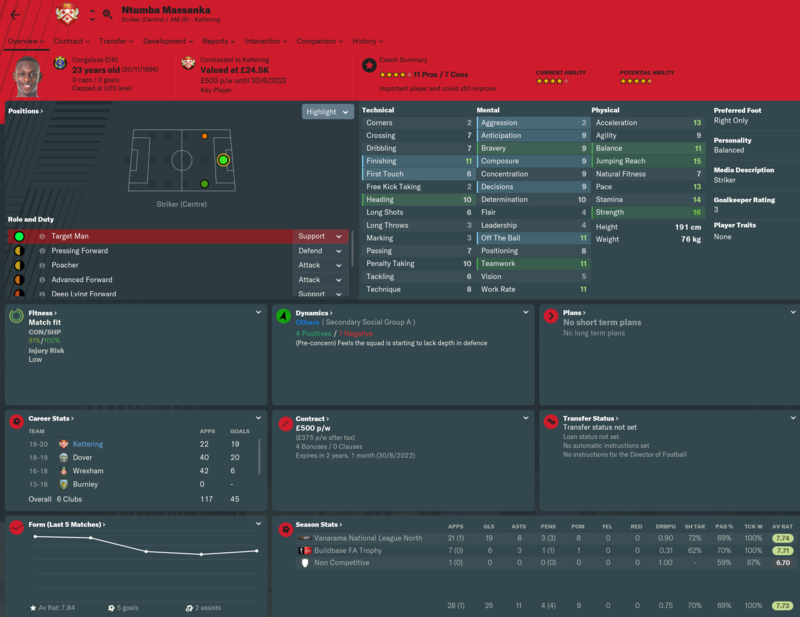 Won't be attempting any parent clubs, but would love to try and see if I could get some danish first team clubs as feeders! This is the starting XI. Chafer, Bentley, Lee, Hursit, Purcell, Saunders and Marks were all here to start with. The others were key signings. I am still a bit short of CB and RB cover but other than that I have pretty good depth. Let's see how we get on! Im not giving up so if i get them i will post the save for you . League Table - It looked easy enough, but Stockport were top until we inflicted their first league defeat of the season just before the new year. League Fixtures 1 & 2 - We had long unbeaten runs on numerous occasions. F.A. 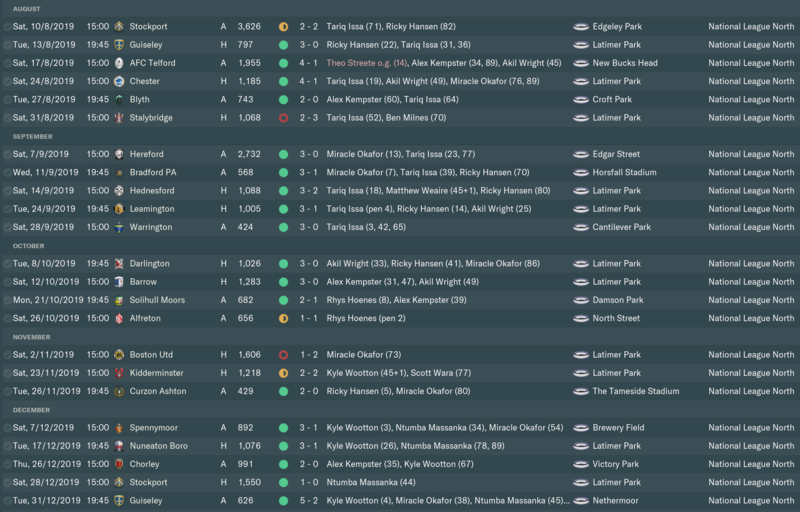 Cup - A decent run to the first round proper, before losing at home to League Two side Leyton Orient. F.A. 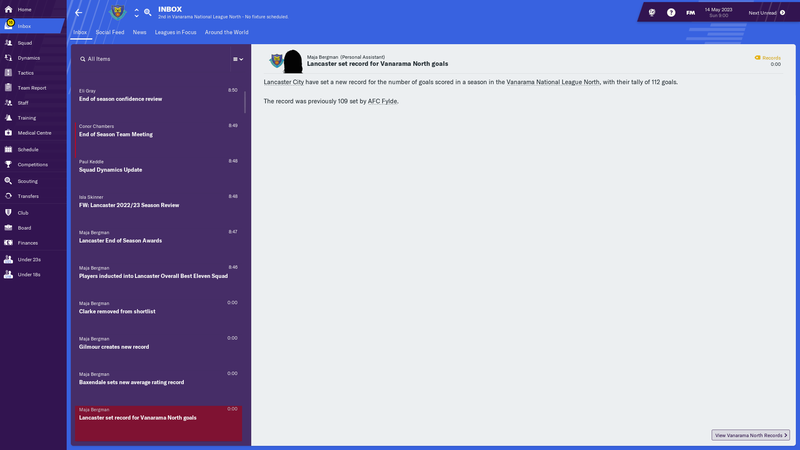 Trophy - An excellent campaign, before a very poor home leg in the semi final saw Vanarama National League outfit Sutton United beating us 4-3 on aggregate. Pre Season Friendlies - The usual mixture of glamour fixtures and away trips to smaller clubs. The highlight was holding Leeds United to a 4-4 draw. Squad - I believe this group of players is strong enough to challenge for a place in the Football League. 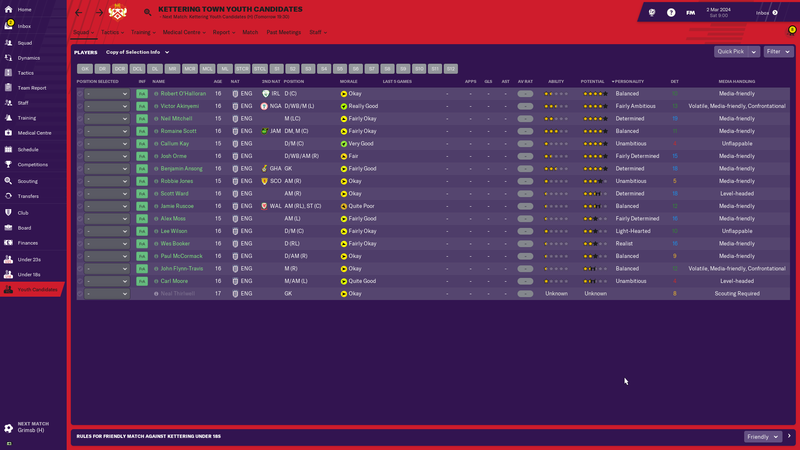 Youth Candidates - A so called "Golden Generation", with George Harrison YP20A1 being the pick of the bunch. Squad Dynamics - Considering the plethora of arrivals, this is surprisingly good. Transfers In 1 & 2 - Quite a lot of arrivals. 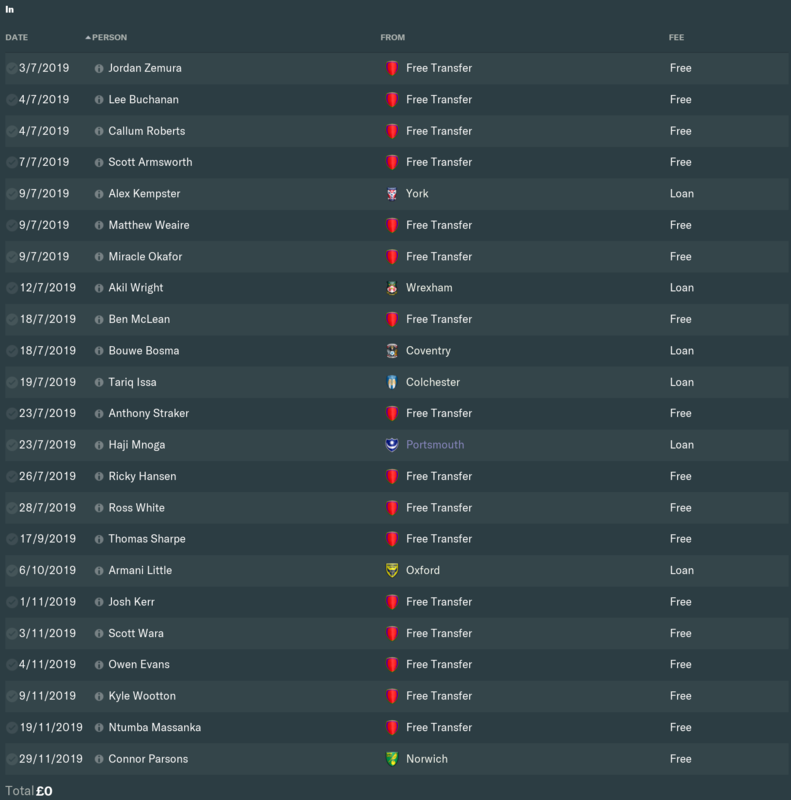 Transfers Out - I struggled to move players on. 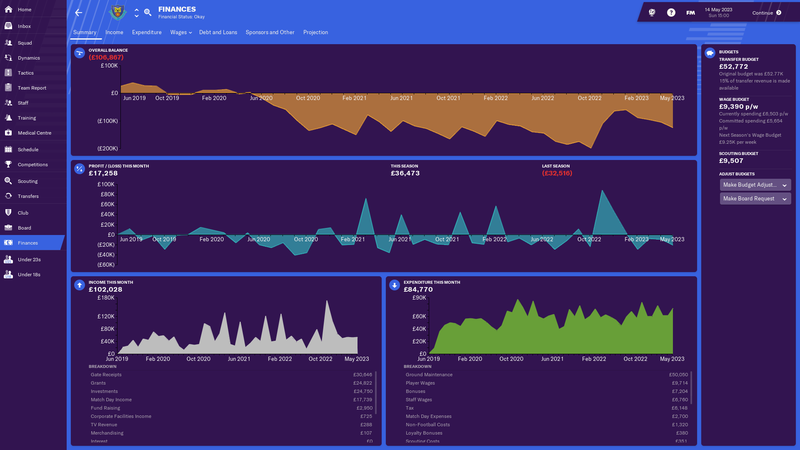 Finances - We look in good shape, though a higher wage budget may make a difference in the coming season. Mickaël Mandron - Signed on a free transfer, the French striker returned 14 goals in his 21 appearances. Josh Kerr - Rated as a potential League Two player, the centre half had a poor season overall. I expect more next season. Ntumba Massanka - The Congolese former Burnley striker scored an impressive 25 goals in 29 games. A revelation. Kyle Wootton - Another striker who excelled this season, with 20 goals in 32 games. 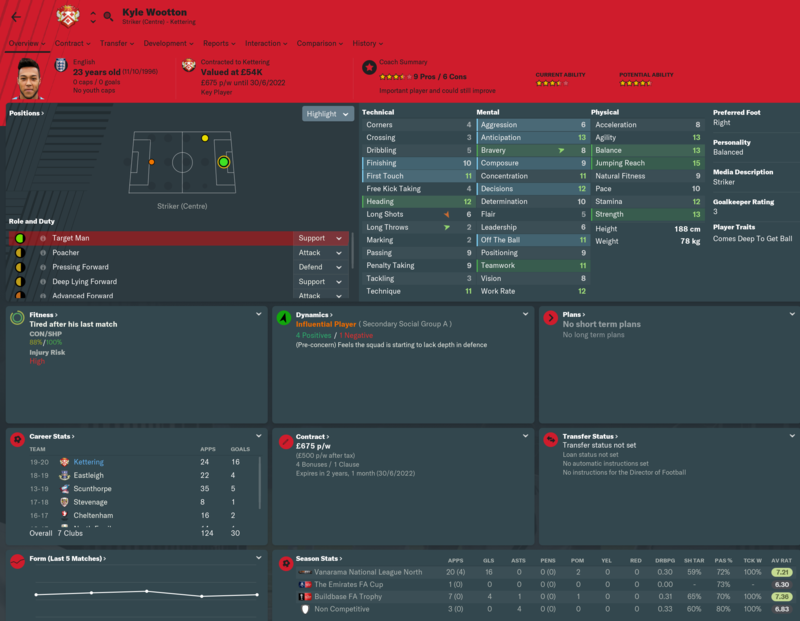 Owen Evans - The goalkeeper had a cracking season, after his arrival halfway through the season. A push for a playoff place is the goal. 2019/20    Vanarama National League North. 1 x Vanarama National League North - 2019/20. 2019/20           N/a                N/a               Vanarama National League North                1st       First round         N/a         Appointed on 25 June 2018. Promoted as champions. Unexpected but welcome. I didn't even have to ask the board. 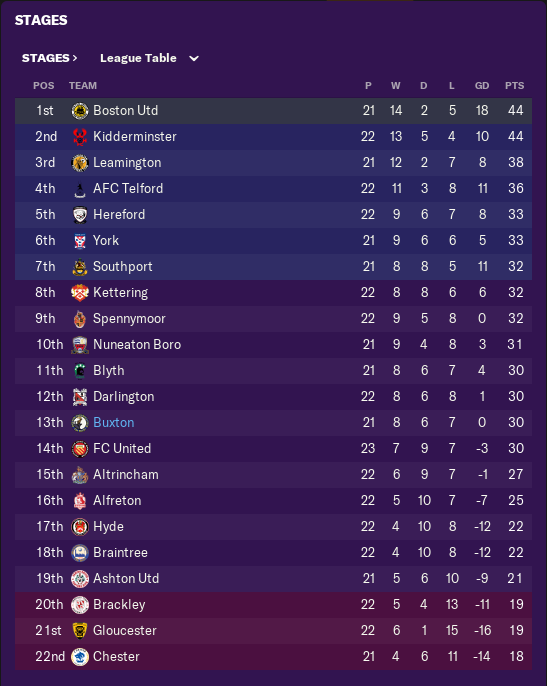 Two good solid season, and I hoped this season were the one where we could push for a top half position and solidify ourselves as a good team in this division. What happened? Well, I were wrong, very very wrong! 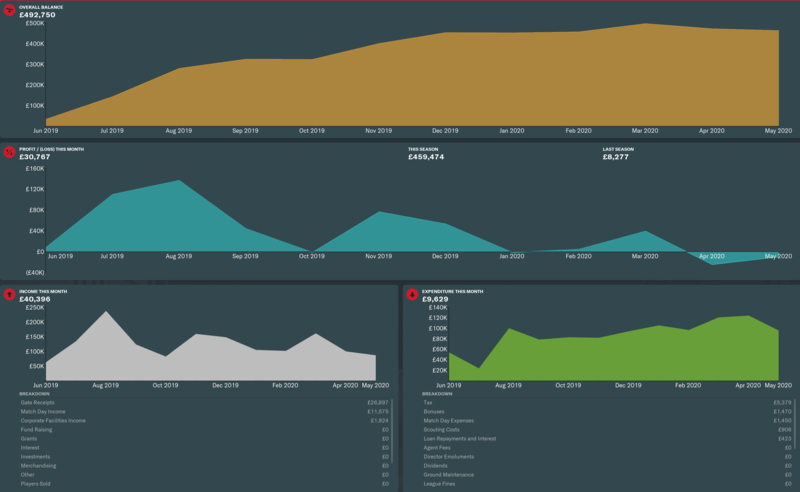 The season started ok though, but we struggled to find any consistency at all. I don't quite know why we are playing poorer than the last seasons, but we really don't play very good. As the months went it were soon clear we were in for a relegation battle this season. Going into winter and spring we had a horrible run and struggled to pick up much points. 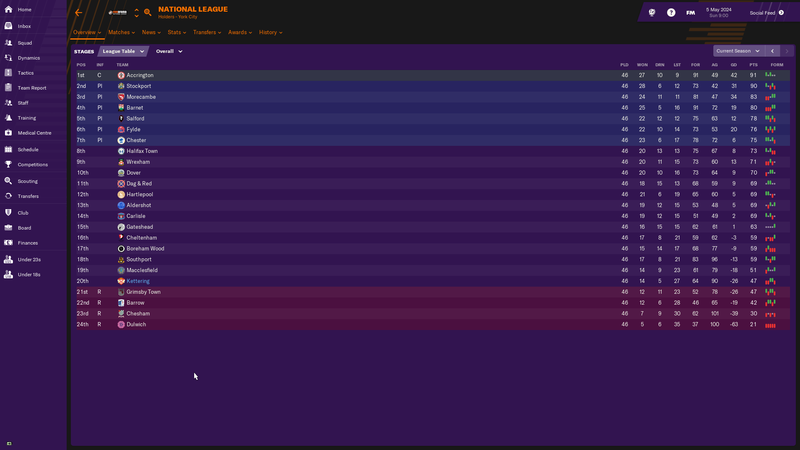 With 4 games left we were just into the relegation zone and the battle to avoid going down were real! We lost to Chester, but managed to win against Chesham and Halifax, but Grimsby had a couple of wins as well. Going into the final match we were above them on 1 better goal difference. So as long as we did the same or better than Grimsby we would stay up. The start were very promising. After 15 minutes we were still at 0-0, but Grimsby were down 1-2. The we had some disastrous minutes were we first conceded, then got a red card, and another goal against on the free kick that lead to the dismissal. Just after half time we conceded a 3rd goal, and were down at that point. Things looked grim, and we didn't have any hope of scoring with one man less on the pitch so the game ended with a 0-3 loss. 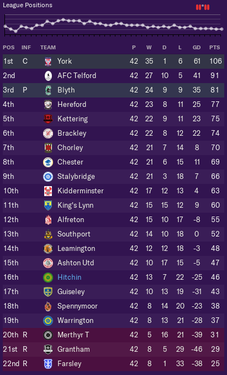 It was then I noticed it, Grimsby had conceded a 3rd themselves, so we finished on the same point total, and the same goal difference! As it turns out, we had more scored goals than them, and that was the tie breaker! We stayed up on more goals scored! 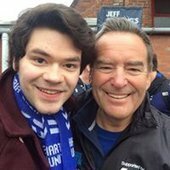 In the FA Cup we lost in the 1st round to Scunthorpe. 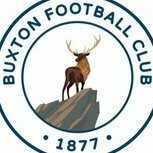 In the FA Trophy we also got knocked out in the first round, this time to Darlington after a replay. 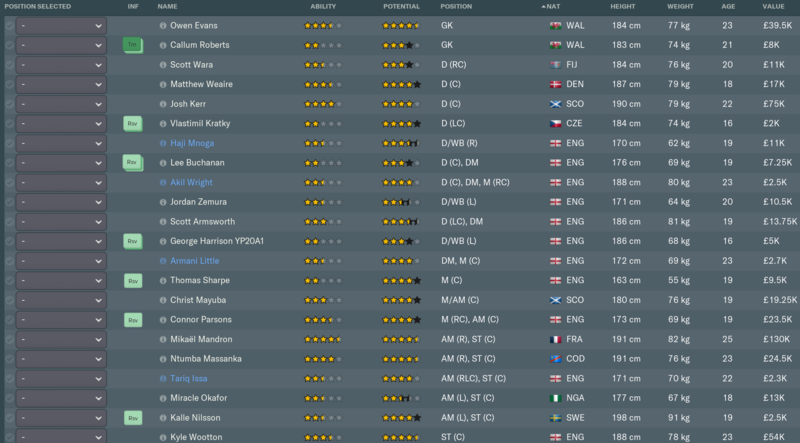 We had a pretty good youth intake. I'm very excited about Romaine Scott 24d. That is a quality intake. Hopefully you can build on them and get straight back up. Wow! 4-4-2 to the rescue as we developed a hoofball strategy very early on. 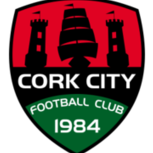 It proved extremely effective as we zoomed up the table and, despite a long period of mid-table obscurity and spells of bad form, our hopes of a playoff spot were only ended 2 games before the end of the season. 9th place is very respectable - I reckon if we could turn some of our draws into wins, we might be in that top 7 next season!! Well then... A poor mistake from our GK in the 2nd Qual. Round against Royston allowed them to take the lead, but we fought back to win 2-1 and secure our spot in the next round. 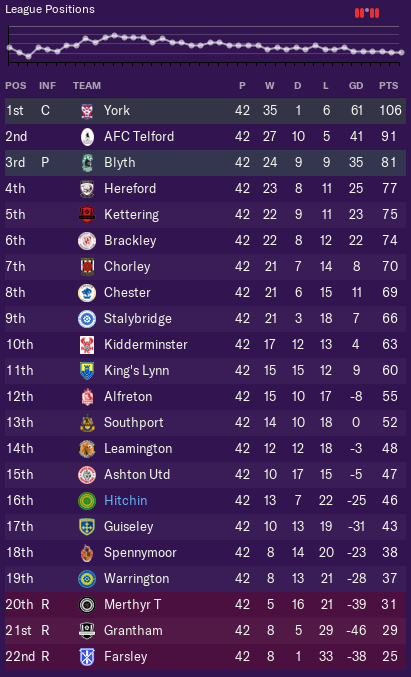 Hitchin awaited at the Silverlands but to my shock, they absolutely dominated from start to finish as a team below us in the league pyramid. We were doing alright at 1-1 until a red card threw everything into jeopardy and they scored two quick late goals to finish us off. Disappointing. Finally, somewhere we exceeded in cup competitions! Spennymoor were brushed aside 2-0 as we reached the First Round vs Southport. I thought it was gone after a 0-0 home draw but we stunned them in an exciting 12-13 penalty shootout after a dramatic 2-2 draw! We then faced off against recently-relegated Cambridge United and an away match vs Macclesfield would've awaited had we not lost the home replay 1-3 (after extra time) following what was actually a very impressive 1-1 draw at The Abbey Stadium. Overall though, very happy. 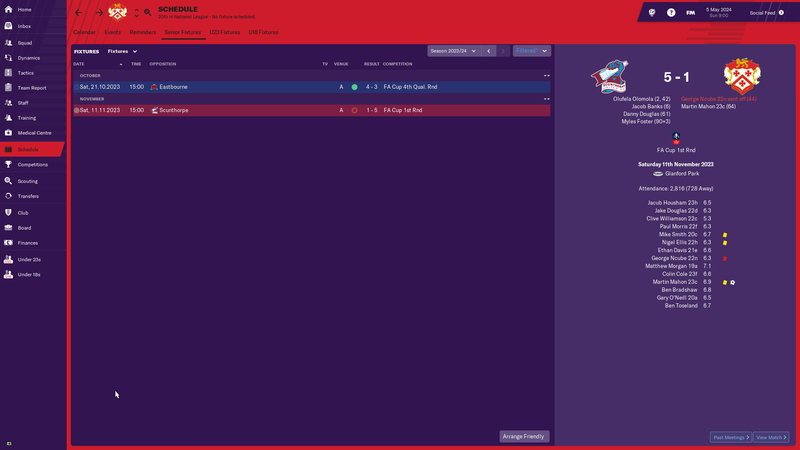 Alpha Kaba's move to Aldershot was out of my control, and I brought in 4 players to try and achieve my goal of a mid-table finish. 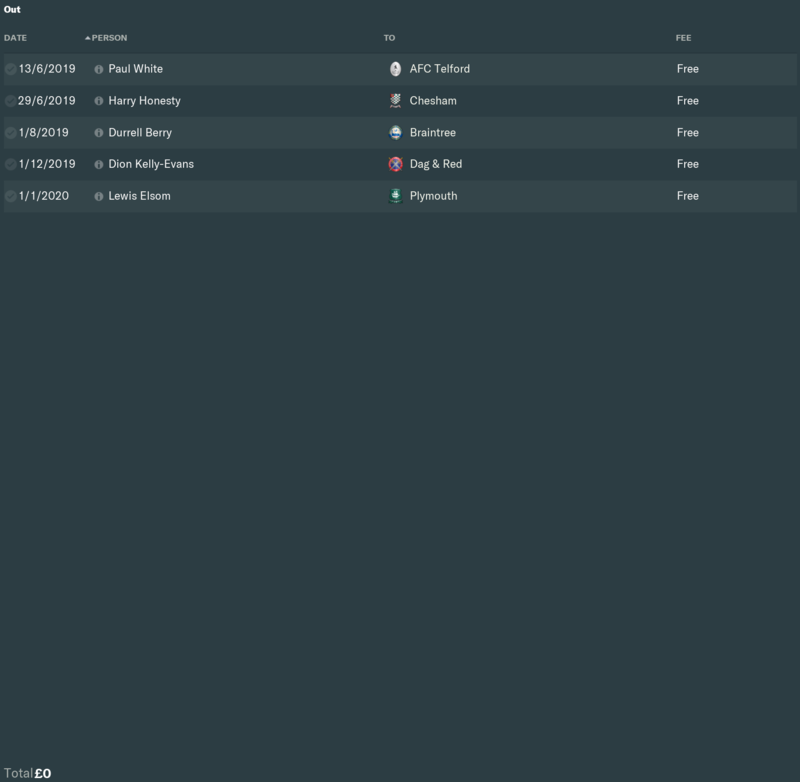 They all had a pretty good season and I'm happy with the business done; finances haven't been great but I'm hoping for a reasonable transfer budget ahead of the summer transfer window! 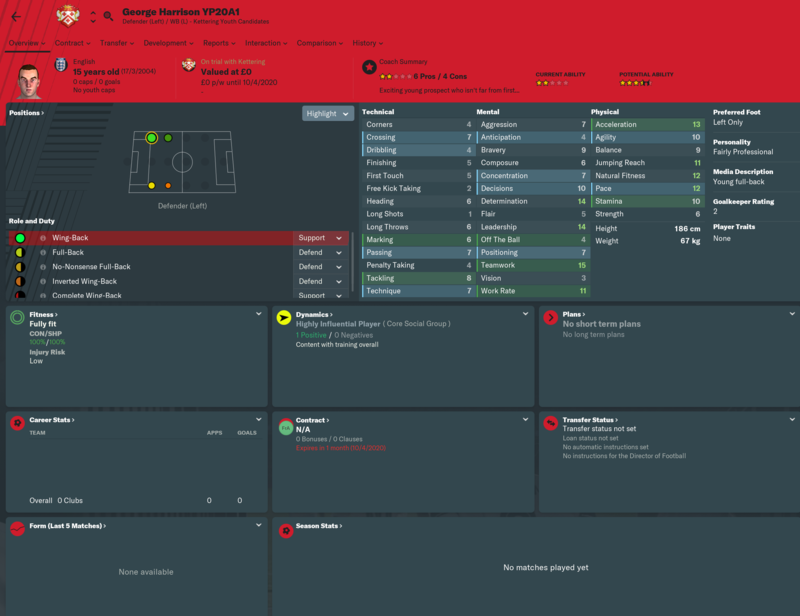 Diego De Girolamo was absolutely key for me this season. 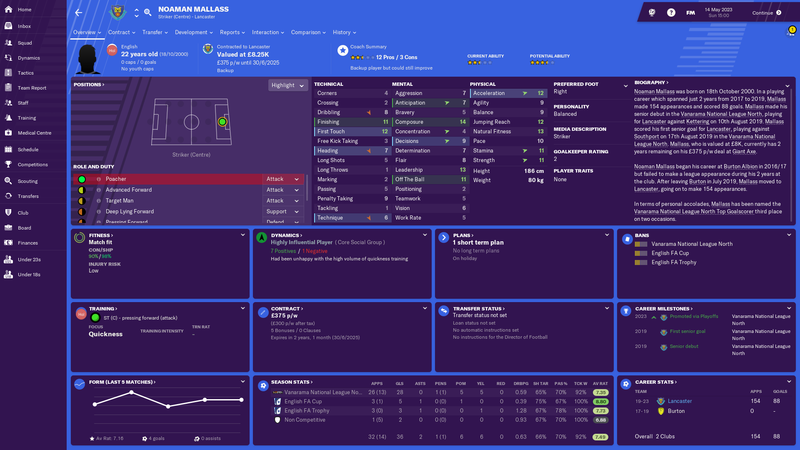 All season long I played a standard 4-4-2 formation with Diego being the target of long ball after long ball over the defenders. It proved extremely effective with the Italian finishing on 23 league goals, joint 6th most in the league. And to think I nearly lost him with him being unhappy at the start of the season, only to ruin our finances and agree a new contract!! Push on for a playoff spot in the league, keep our best players, keep our fingers crossed for a good youth intake and get as far as possible in the cups!! We were the third best team at home over the course of the season but were mid-table level away. 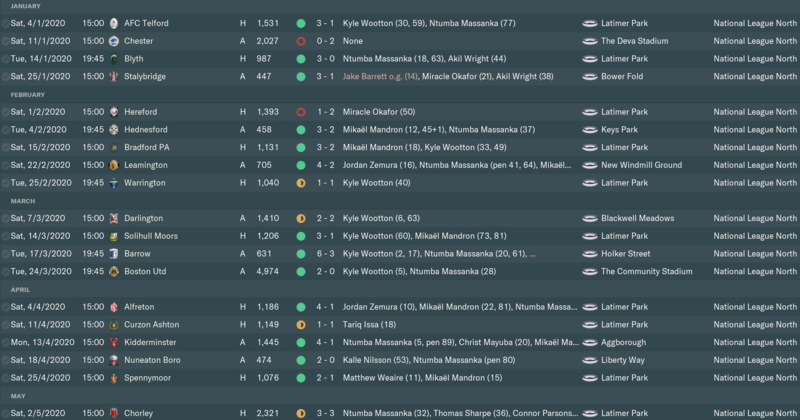 Couldn't figure out any sort of consistent tactic on the road and it showed in the playoffs where we went from a dominant 2-0 performance in the first round to being played off the pitch in an 0-2 semifinal loss to Chester. I ended up dumping almost everyone, mutually terminating quite a few until we only had 4 left. Two more will leave in the summer because they aren't justifying their wages. I want to get rid of the last two, but no one will sign them and the termination fees are too high. 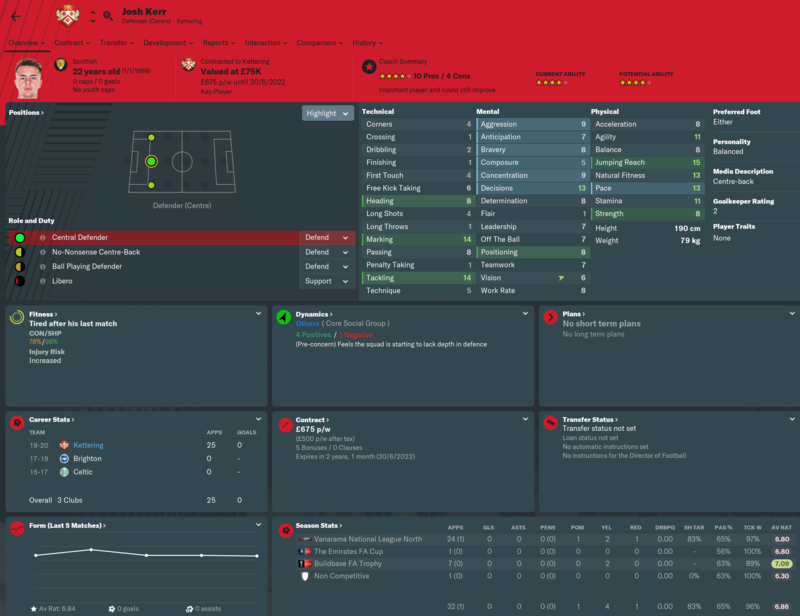 Our best player and top scorer was a loan signing with 5 finishing and incredible physicals. We will look to build again this summer with more young players who didn't make the cut at their larger academies. Our facilities are still crap. Finances are terrible but the board has provided enough cash to keep us running. 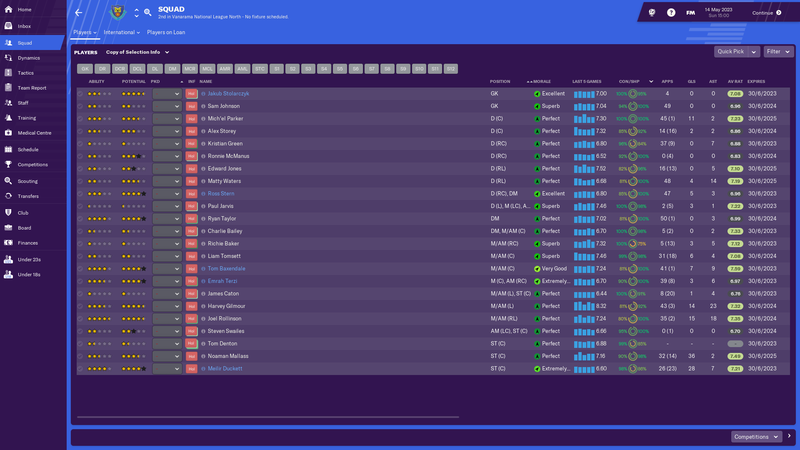 Reputation is still quite low, so we struggle to bring in players, but we were also predicted 20th this year despite coming in from a higher league so the board still have me at very secure. 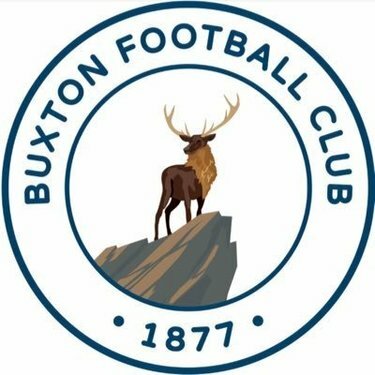 Hopefully with some additions we can win this league next year and get some recognition.